← What’s the deal with San Rafael’s one-way streets? Recently, Bob Silvestri, a proponent of auto-oriented, low-density development, argued that auto-orientation is more energy efficient than person-orientation and, therefore, superior. Yet his data, while implying that New York City or Paris are terrible polluters, does not support his thesis that Marin is the pinnacle of environmental quality. That’s not to say his data doesn’t have problems (it does), but let’s take the assumption that he’s measuring the right things and that the studies he cites are unimpeachable. Per-capita greenhouse gas emissions by development type. Image from Demographia. 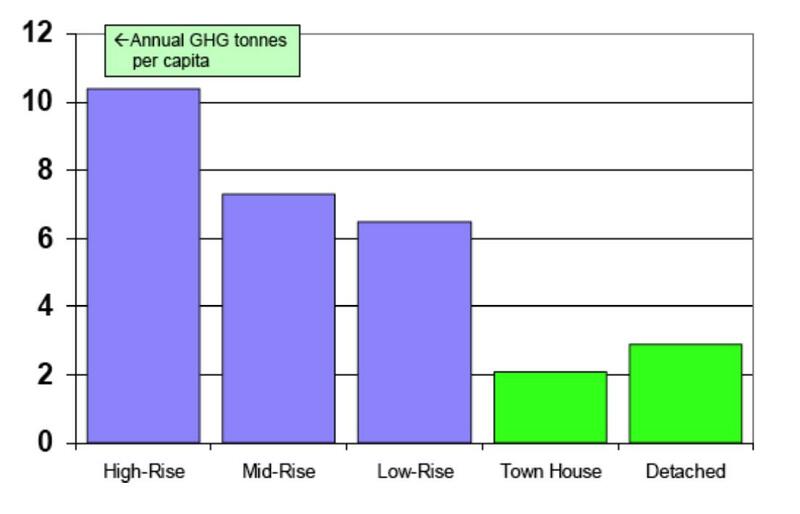 Silvestri cites a (rather flawed) study (PDF) of greenhouse gas emissions per unit for a number of housing types, from high-rises to detached homes. Single-family detached homes were scored second best for all emissions in the Australian suburbs studied, with only town houses scoring better. Simultaneously, Silvestri makes the quite important point that open space is a carbon sink. It’s undeniable that the more open space we preserve as a region, the better off we’ll be from a sequestration standpoint. The EPA says open space takes in 2.5 metric tonnes of CO2 per acre per year (MTCO2/year), agricultural or recreational land takes in 1.5 MTCO2/year, suburban land takes in 1 MTCO2/year, and urbanized land takes in 0.2 MTCO2/year. Town homes, which lie somewhere between urbanized and suburban land, still leave plenty of open space in the back yard (often 50 percent). We need to estimate, but let’s put that as 0.7 MTCO2/year. I will assume these numbers take into account commercial development patterns as well. Silvestri measures San Francisco’s net emissions against Marin’s net emissions, but that’s not the way to evaluate optimal conditions. It unfairly punishes San Francisco for having small political boundaries and rewards Marin for having expansive boundaries. Rather, we need to establish a baseline of nature and determine how different methods of development will change the carbon status of the same land area. So, we have 640 acres (1 square mile) of virginal open space producing a net negative 1,600 MTCO2/year. We’ll people that with 100 households in a traditional suburban setting of about 4 homes per acre, which again will include commercial development. Using the average household size in the US, that means 259 people on 25 acres. According Silvestri’s Australian data for per-unit emissions, people living in suburban areas emit about 2.5 MTCO2/year apiece. With 259 people, our little town emits 647.5 MTCO2/year. Subtracting our sequester, which is now 615 acres of virgin land and 25 units of suburban, our square mile goes from a net negative 1,600 MTCO2/year to a net negative 915 MTCO2/year. Not too shabby. Next door, another 100 families has set up shop on another square mile of land, but, inspired by Europe, these guys want a village of town houses at a relatively loose 25 units per acre. Rather than 259 people on 25 acres, this village will only use up 4. Since town home denizens pollute less than suburbanites, they’re only emitting 518 MTCO2/year. Since they’re living on less than a sixth the land area, there’s more virgin open space to absorb their footprint. All told, the village goes to a net negative 1,075 MTCO2/year. This other village, of course, will reap the other benefits of compact development. They will need to maintain fewer fire stations, fewer roads, fewer pipes, etc. Changes to travel patterns will mean less driving over the baseline and more walking, bicycling, and more transit users. That means they won’t have to maintain large parking lots or such wide streets (which means more environmentally friendly stormwater management), and the citizens won’t need to go to the gym to stay healthy. As a bonus, with the money saved (and it would be substantial), they could electrify the whole transit system, rendering moot Silvestri’s argument that transit as too carbon-intensive. Then again, a townhome-style city is ideal for cycling and walking, so there wouldn’t be as pressing a need for transit anyway. Far from supporting single-family housing, Silvestri should be supporting the kind of densities town homes provide, which can go as high as 60 units per acre. They are far more financially and space-efficient and less carbon-intensive than single-family homes. That’s in his data, clear as the day. I don’t know why Silvestri would try to twist the data into saying something it doesn’t, but the study itself does the same thing. The author, Wendell Cox, has done some good research on cities but has come to some odd conclusions: that suburbia as we know it is the result of free-market choices (it isn’t, and is instead the result of $450 billion in annual federal subsidies) and that Seattle’s suburbs are growing much faster than the city proper (they’re not). I’ve found it’s best to approach anything associated with Cox or his firm, Demographia, with a healthy dose of skepticism. I hope Silvestri will join me and other urbanists in support of the kind of infill development that he has championed in the past. It offers a much better path to lower greenhouse gases than the Santa Clara-style sprawl his ideas advocate in the farmland and open spaces of Napa, Solano, and Sonoma. Dave, you are making a logical fallacy when you suggest that carbon emissions drop in high density places. You are looking at “per capita” data but this is an irrelevant fact. Total air pollution is greater in high density environments. It does not matter if the “per capita” pollution is less if we all breath the same air in the environment. Think of it this way. If we distribute 100 dollars to 4 people the “per capita” wealth is $20 per person. If we distribute the same 100 dollars to 100 people, the “per capita” wealth is $1 per person or ” dramatically drops wealth by 20 times. But you have not created more wealth. You have simply redistributed it differently which gives you apparently two different outcomes. Hi density CONCENTRATES pollution. Suburban densities diffuses pollution, each with it’s own carbon buffer (a lawn, parks and trees) for a overall healthier environment. The only variable is how much energy is needed for daily living. Smart growth advocates glibly respond that people will live closer to shopping and work. This is ridiculous. In a free economy people can choose where to live, work and shop. It does seem that many planners think they can or should control this too. It is called a centrally planned economy and has been proven to be a massive failure in country after country in Europe and Asia. The One Bay Area Plan is built on false promises, failed ideology and bad science- not to mention foolish politics. I don’t think we’re talking about the same things. CO2 is what Silvestri was concerned with, not other pollutants. Having CO2 widely dispersed in an environment doesn’t matter, as it’s not toxic. The problem is the overall amount released, which is, according to Silvestri and Cox, higher in single-family home environments than in town house environments. Yes, high-density housing concentrates the problems of human habitation, but the point is that inhabiting everywhere just a little means there is no virgin land or open space. Allowing cities to flourish preserves more areas for virgin open space (not to mention helps groundwater by limiting the absolute amount of impervious surface). And I won’t even touch housing demand here – that’s for another piece. This one is all about the CO2. In nature there is no such thing as “virgin” space. Certainly not in Marin anyhow. We have been farmed, logged, grazed, and built upon for centuries. I live next to a 6000 year old Miwok habitation. Nature is dynamic and ever changing. There is the wild and their is tamed nature but biologically speaking both have their advantages. In Marin, we are awash in green space but by urbanizes a tiny slice along the 101 freeway, we are degrading the built environment and create less healthful places for people to live. But let’s look at the cleansing effects of greenscape. The most heavily polluted areas of our country are cities (perhaps not per capita but total amount of pollutants people live among). How is this better or more humane? Are you suggesting we all move to heavily polluted environments so that so called “virgin” environments can exist? Are you certain that these “virgin” places are more efficient “carbon sinks” than a dispersed environment in suburbia. What scientific evidence supports this theory? Total CO2 production is a red herring. I do not think the distribution of habitation matters much in terms of efficiency. If you reduce living space and force a lower standard of living, you will reduce CO2 production but is this a good thing? A less productive economy produces less food, shelter, books, and everything that people need and want to live a healthy, fulfilling life. Try telling someone starving in Sudan, that due to less efficient organic growing techniques, you will only supply half the food needed for their country. There are profound moral, ethical and political dimensions to this “smart growth utopia” , One Bay Area Plan proposes to impose on us. We live in one of the healthiest suburbs in the Bay Area and some want to urbanize it based on faulty statistics, ideology and flawed science. Take up the single-minded focus on CO2 emissions with Silvestri, not me. I’m taking his goal (reduce CO2) and his data and writing up what his data says about his goal. As for sequestration effects – I am, again, going on data Silvestri used. In this case, it’s from the EPA, which I have no problem with. And feel free to change “virgin” to “wild”, though that feels like nitpicking. As for total CO2 production – if you think distribution of population has no effect on that, well, again, take it up with Silvestri. As for the other pollutants that aren’t CO2 – which ones are you referring to? Ecosystem-wide runoff is better under more compact land-use patterns. This is because, as you alluded to, we aren’t paving a paradise because don’t have to under more compact living situations. Yes, localized emissions from density are generally from automobile traffic, but that just means we should do what we can to clean those vehicles and deal with their effects. For those who don’t want to deal with the city at all, drivable suburbs like Marinwood and walkable suburbs like Fairfax will still be there for them, just without the $450 billion in annual subsidies that distort the housing market. If there is still high demand, then we’ll see new detached homes built and bought further and further from the City. Let the market do its work. I absolutely, entirely, completely do not want to ban single-family detached housing, but I don’t want people like Linda Pfiefer and Bob Silvestri to promulgate ideas about that kind of housing that simply aren’t true and aren’t even in the data they use. We need to approach all forms of housing with eyes wide open so that we can understand our towns, subdivisions, and cities better. Otherwise, we approach the entire subject of the city in darkness.